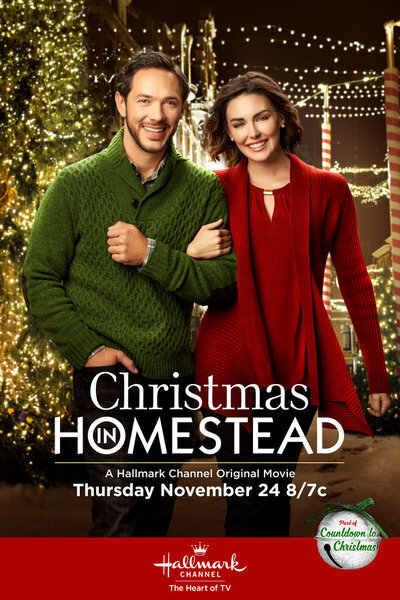 If you want to give Christmas in Homestead its due, put it near the beginning of your Hallmark holiday marathon. The movie isn’t bad, which counts for something, but it’s not the most thrilling thing on the calendar either. Mostly it allows its two appealing leads to languish while waiting for something interesting to happen. But then, this is what happens when you waste all your resources producing cookie cutter stories instead of pooling talent together in order to rise above mediocrity. The story is about movie star Jessica McEllis (Taylor Cole) who finds herself in a tiny town. For once, she’s not there accidentally or to escape the wasps’ nest of fame. She’s there to work and is shooting her latest movie with her ex-boyfriend, meathead Vince (low-key Ray Liotta lookalike Jeff Branson). It’s all wrong though. Vince thinks he’s still got a chance, the director is demanding, and all she wants to do is to escape to Fiji with her best friend. But first she has to survive a few days in snowy Homestead, Iowa. Well, lucky for Jessica because as the Hallmark gods would have it, the mayor of Homestead and owner of the lodge where she staying at is also a bit of a grump. Matt Larson (low-key Lin-Manuel Miranda lookalike Michael Rady) is not usually this way, but his is a town that takes its Christmas seriously. There’s something going on every night; if it’s not the tree lighting ceremony, it’s the snowman building competition, and Matt wants to make sure the holidays proceed without a hitch. So a big film production invading his town in the middle of the high season is not the kind of the orchestrated merriment he has in mind. Poor Matt is out of luck though, and pretty ineffectual at his job. The town is constantly voting down his efforts to curtail the production, which he thinks will interfere with the spirit of the holidays. In fact, his daughter (Brooklyn Rae Silzer) is often the one leading the revolt. It seems that while everyone loves Christmas, they love movie stars more. The relationships are key in this movie, and they unfold with varying degrees of success. Cole, Rady, and Branson have an interesting sort-of love triangle that moves in a sort-of surprising direction. After their initial meeting, the two leads don’t have much to do. Jessica and Matt have some mandatory obstacles to overcome, the chief one being her fame and his desire for anonymity. The actors have a certain unflappability though that makes their problem-solving somewhat perfunctory. The more intriguing pairing is between Matt’s sister, Zoe (Katrina Norman), and paparazzi photographer Ian (Michael Nardelli). The stakes are higher between these two. She catches him wanting to sell a photo of Jessica kissing Matt, and he has to make a choice while juggling ethics, his livelihood, and the feelings of the girl he likes. This relationship is far more unpredictable and better entertainment because of it. At the very least, this subplot will give those who insist on watching something juicier to chew on. Posted in USA, Western TV reviews and tagged Christmas movies, Hallmark Channel, TV movie on December 23, 2017 by limmer13.